At the police station a potential source of the Trouble is in the cells, Victor. He handed himself in to try and be kept away from people. Except when they interview them he tells them every time he touches someone, he sees how they will die some day which has left him really not wanting to touch anyone. He had the sickness – but it just triggered his Trouble (maybe he was the first one sick). He also decides to grab a gun and point it at them – only briefly though before handing it back. Audrey’s also getting sick herself and as Victor helps her he sees her end – he says she and her “twin sister” go at the same time. More details would be helpful at this point. Audrey doesn’t follow that up because she’s looking at the created bears and realising that could be her – they assume Duke split her from Mara, but she lost her Trouble immunity: maybe Duke didn’t split them, maybe he created Audrey. Maybe Audrey isn’t real. Nathan responds to this very genuine and fascinating conflict with sappiness. Audrey collapses coughing – I know, that much gooeyness makes me want to cough up a ling too. Dwight has taken Charlotte out on a little trip into the country to tell her about the Troubles – by showing off his. Surely they can find a safer Trouble than this? She sees the bullet impossibly hit him so then he can explain the Troubles. She’s very sceptical though. She gets over it and applies what I’m going to laughably call science to the disease: she decides Dwight can’t get the disease because the last stage of the disease is to trigger the person’s Trouble but his Trouble is always on. Knowing about Dwight and Charlotte being all friendly, Duke makes a terrible decision and decides to let Mara go so they can find the disease Trouble, resolve it and get rid of Charlotte so he doesn’t end up with her experimenting on him. Which means getting Mara to fix the Trouble – she points out she needs Aether which has Duke make an even worse decision and decide to get her some. They do get briefly swapped at the quarantine but this is the worst quarantine ever. Meanwhile Troubles are getting out of hand and they get several deaths and injured from someone throwing around acid which rather perturbs Pete who was there. Nathan goes to see him and we find out why this random character had suddenly been shoe-horned into the story and everyone was acting like he was always there – he is the one with the plague Trouble, he is the one Victor caught the disease from. Pete does the maths and concludes that yes he is the source of the contagion. Charlotte’s appearance stressed his Trouble into manifesting. He follows through his own maths and realises that by the end of the week every Troubled person in Haven will have their Trouble manifest uncontrollably. The problem is that Pete is not the most emotionally controlled or mature of people so it’s nearly impossible for him to get it under control. Nathan brings him to the hospital to get Audrey to look at him, while Dwight hopes for Charlotte. Then someone’s non-breathing Trouble hits the hospital which isn’t the best timing – Kurt (or maybe Kirk?) is the one with the suffocation Trouble. Nathan focuses on Audrey (of course), getting her oxygen. Mara finds the Aether and Dwight finds her and they both collapse because of the air issue. Duke, a free-diver with the lung capacity of a whale, rescues Mara, but not the Aether. Peter approaches them outside when they’re out of options and tells Duke he has to kill him – Duke’s Trouble-ending-Trouble will then save the town and remove the plague Trouble (actually since Duke is manifesting Troubles it’s more a delay than anything). Duke protests that he can’t and Mara stabs Pete in the neck (she can). So now Duke has to finish Pete off or the disease will keep running rampant (she’s very practical like that – Pete dies to end the plague or he dies in vain). Vince is also trying to get rid of the CDC, speaking to an apparently important man called Mr. Simon and convincing him to help by showing off his Guard tattoo. Alas, Mr. Simon checks up, learns Vince doesn’t lead the Guard any more and, apparently, Dwight isn’t in favour of getting the CDC away from Haven. So Vince decides to go for blackmail instead. 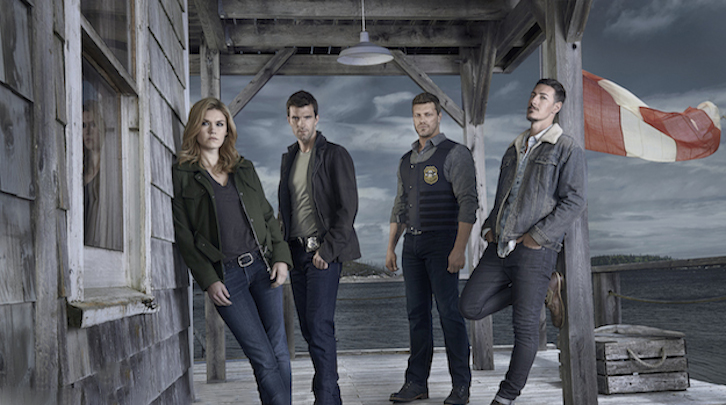 He discovers there is no CDC agents in Haven – so who is Charlotte? The immense leaps of logic from Charlotte are stunning in their scope – how does she even know Troubles are created? She’d already identified it as a genetic trait! Pete is a clumsy insert. Yes, I know Gloria referred to him as something of a shut in in the last episode but from what we’ve seen of him, while he lacks people skills, he’s clearly not that incapable of being around people. He’s also a statistician with, among other skills, expert knowledge of tracking down patient zero of an outbreak. In five seasons of trying to figure out who was causing the random Trouble of the week, it beggars belief that no-one thought to mention this guy. Mara and Duke – NO NO NO NO NO NO NO NO NO NO NO NO NO NO NO NO NO. That is all. Ok time for a little irritation – I find I’m having that Haven feeling again. See, I don’t think I’ve ever ever ever disliked Haven, each individual Trouble of the week is generally fairly well done (albeit clumsy and with lots of leaps of logic) with a decent amount of imagination and I don’t dislike any of the characters (their decisions however…). But this show has a terrible habit of approaching a main mystery – touching it, hinting at it, then dancing around away from it and spending the whole season merrily running around it without actually addressing it. Sometimes a new major meta plot will arrive and consume the whole season (like a shapeshifting murderer or finding Audrey’s long-lost son) until you reach the end and realise that the actual main meta (what and why of the Troubles) hasn’t gone anywhere. They’re still good storylines – but the main plot is stalled. This season may be the worst for that because we’re SO CLOSE. We have Mara and William and Thinnies and the Teagues and Croatoan and… oops we’re all dancing around it again. And in comes Charlotte the mystery doctor who is not what she seems. And, the CDC investigating? Great, interesting plot line, I’d like to see. Mystery doctor being mysterious? Also, totally interesting and something I’d like to see – but again the Thinnies, Dave’s festering leg et al have all taken a big step back and unless Mara and Duke in their eternal quest to be really foolish pick it up, it will be lost.